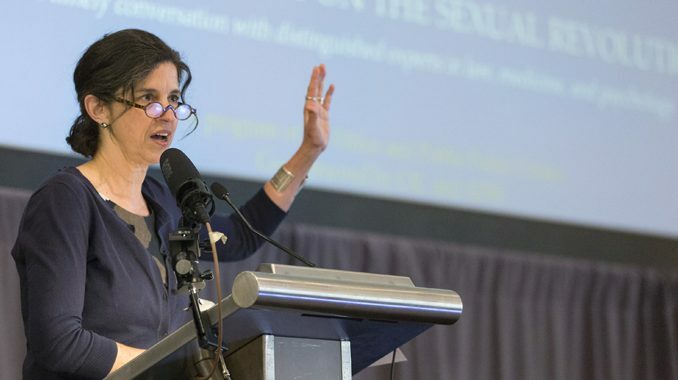 This was the response of Deborah Savage to the question, “What do you think of the Catholic Women’s Forum?” Savage is a philosophy and theology professor at the St. Paul Seminary at the University of St. Thomas in St. Paul, Minnesota, as well as director and co-founder of the Siena Symposium, a Catholic think-tank. The CWF was founded by Mary Rice Hasson, the Kate O’Beirne Fellow at the Ethics and Public Policy Center and director of the CWF, and Helen M. Alvaré, Professor of Law at the Scalia Law School at George Mason University and chair of the CWF’s Advisory Council. The CWF arose from a symposium on women and the Church that Hasson and Alvaré organized in 2014. The mainstream media has played a significant role in making dissenting female voices the loudest. For decades, they have been boosting the voices of women who claim to represent the Catholic Church while opposing Church teaching. Rosemary Radford Ruether, for instance, was long the go-to female Catholic expert for the secular media, though she not only dissented from the Church’s teachings on women, she didn’t even accept something as fundamental to Christianity as the Resurrection of Jesus Christ. Alvaré described the synergistic quality of their discussions: “Someone will say, ‘I see your legal point, but here’s how that’s working out for me in the theological arena…’.” Or “‍ ‘I did a law and sociology paper on that, which you’re considering philosophically, and here’s how the qualitative research … would validate the point that you’re trying to make.’ It’s very rich,” she told CWR. This core group of scholars are connected on a listserv, which they use on a regular basis to “have in-depth conversations about theological, cultural, and pastoral concerns,” Hasson said. “Encountering the Poor: A Feminine Lens on the Problem of Poverty” (2017). While the symposia are invitation-only events, their benefits are widespread and ongoing. Thus far, the CWF symposia have resulted in more than 40 scholarly papers which aided the theological and pastoral work of the Women’s Section of the Vatican’s Pontifical Council for the Laity (now the Dicastery for Laity, Family, and Life). Symposia presentations are also made available to the public in videos (see links above) and in written form. The papers from the first symposium, for instance, were published by Our Sunday Visitor in 2015 under the title Promise and Challenge: Catholic Women Reflect on Feminism, Complementarity, and the Church. This well-received book is proving to be a valuable resource for women’s groups, Catholic laity and clergy, and diocesan offices. Though two additional books are forthcoming, the need to bring the scholars’ work into the public discourse more quickly has meant a shift toward pursuing more immediate, individual publication as well. “There are so many topics of such importance to the Church now,” Hasson explained to CWR. Some of these scholarly papers, as well as many shorter, timely pieces, are available on the CWF website. The 2016 symposium bore an additional fruit: The Gender Project, which provides formidable resources for countering gender ideology with Catholic anthropology. The symposia and their resulting publications are only a portion of what CWF does. In addition to the core group of scholars, the CWF also connects a larger network of nearly 3,000 women through its bimonthly newsletter, website, and social media. Through these channels, they promote and publicize the work of women doing great work serving the Church and share a variety of new developments and data, as well as helpful publications on many issues, with their broad network. A couple times a year, the CWF also holds networking events in Washington, DC, which usually include a speaker or a panel of women, while giving hundreds of Catholic women opportunities for professional insight, faith formation, and fellowship. 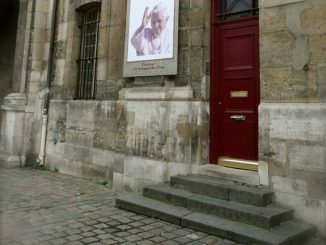 Within days of Pope Francis’ pronouncing on August 26 that he would not say “a single word” in response to the first letter of Archbishop Viganó, CWF Director Mary Hasson composed an open letter to the Holy Father, “humbly implor[ing]” him to answer questions raised by the former nuncio’s allegations. She sent out an email alert to women in the CWF network on August 30, inviting them to sign and share the letter. By August 31, there were over 17,000 signatures. 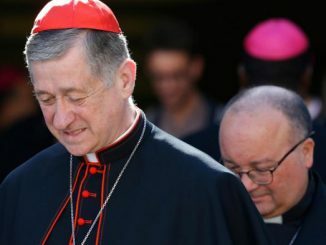 After the first week, Hasson presented the letter with 32,000 signatures to the papal nuncio in Washington, DC, for direct delivery to the Holy Father. 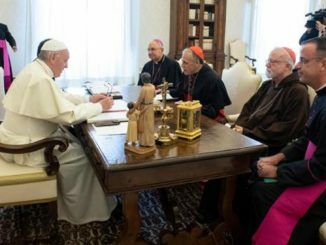 After the Pope met with American bishops on September 13, she brought the letter to the nuncio again, this time with over 46,000 signatures. In a mid-October update on the CWF website, Hasson wrote that while the Holy Father has yet to respond and she doesn’t know if he has read the letter, she sees other direct benefits from it; for instance: “Numerous priests and bishops have shared with me how grateful they are for our letter—how it has encouraged their faith and strengthened their resolve to make things right and to press for greater transparency from Rome and in our dioceses.” The CWF letter also inspired Catholic Men United to write their own letter—with a pledge to undertake “difficult fasting” for over two weeks—which gained more than 10,000 signatures. The CWF is hosting “The Future of the Church: Synod, Scandal, and Solace” on November 29, 2018, in Washington DC, with Distinguished Senior Fellow of the Ethics and Public Policy Center George Weigel as the keynote speaker. More information on this free event can be found here. In just four years, the Catholic Women’s Forum has rapidly grown into an international network providing vital insight, analysis of the empirical record, and commentary from female Catholic scholars to help defend and explain teachings of the Catholic Church that the world finds so controversial. I think it’s good to have women with various types of expertise collaborating with each other, however, I do often feel that there is a prejudice against women who do not have elaborate credentials. Catholic women, of all women, should recognize the importance of mothers and wives and just women (which isn’t to say that mothers and wives cannot have degrees, they certainly can). Women have a valuable voice as women, our experience matters even if we don’t have a scholarly background. We shouldn’t just be listening to women who are scholars as if they comprise an elite group whose voices should be valued but not listening to mothers and wives “who haven’t done anything else with their lives”. Agreed – you took the words from my mouth. A Catholic women’s forum should contain Catholic women from all walks of life, all ethnicities, all ages, all economic levels, all educational levels, and even converts like myself. I pray the voice of the laity is not shut out – again. I’m a woman, and I’m fed to the teeth with identity politics, whether in the world or in the Church. Some women should be listened to. Some shouldn’t. It’s not the fact of their being woman that is the issue, it’s what they’re saying. It’s a false interpretation, and I see no reason why faithful Catholics, male or female, should knuckle under to the knuckleheads making the assumption. Phrases like “the prophetic voice of women” are just silly. Women do not have a united voice, and even if they did it would not be a prophetic one. We are all special because we are made in the image and likeness of God, and His only Son gave his life for us. That’s all of us, male and female, and this constant dividing is horrible. Thank you for saying for what I’ve been thinking/feeling but could not express in words. If it weren’t for the work of women, no parish would be able to carry on. It seems to me that first and foremost women should be evangelizing beginning with the family and having more children. The West in is a stage of demographic suicide. In the U.S. it is not as bad as in Europe due to immigration. Women scholars are welcome, but there is a greater need of Christian mothers. There are other essential areas where women are making a great contribution such as the pro life effort. In the Church of the first Christian centuries, women had a very important role in the evangelization of the home and charitable work. Virgins and widows were a kind of order in the Church and maybe we could restore that ancient Order of Widows. 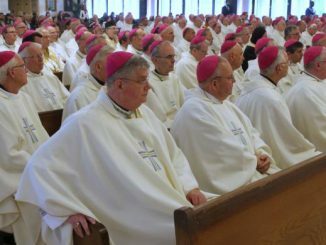 As for more women on the altar, deaconesses, I am against it, as it would only convince men even more that the Church is a women’s affair. Amen to all the above comments. As a very busy owner of a small business I have no time to flit off to Washington DC, to conferences run by the Catholic “elite” I am educated, a bachelors and two masters, but I find I do not resonate with the “professors and scholars” and their elitist bubble way of thinking. My guess is that they have never worked as a volunteer in a parish teaching children religious ed classes, have never been to a poor parish helping paint the class rooms on a week-end in that poor parishes Catholic school and the list goes on and on. But they have their listserv, which they use on a regular basis to “have in-depth conversations about theological, cultural, and pastoral concerns.,”. But the everyday, ordinary women is ignored as usual and continues to love the church and serve her.